Six-year-old twins Christopher Ikaika Schutte, left, and David Kawika Schutte were born with neutropenia, a disease marked by the absence of white blood cells. A 6-year-old Waianae boy with a rare blood disorder is alive today because an anonymous woman having a baby donated the umbilical cord that's normally thrown away. David Kawika Schutte, son of David and Christine Schutte, received the gift May 6, 2005, in what doctors said was Hawaii's first cord blood transplant. "When I talk to friends, all I say is, 'If there wasn't a cord blood donor, my son wouldn't be here today,' " David Schutte said. "It's given us two years more," added the 32-year-old father of four. "I'm happy for that. We live day to day. No one knows what tomorrow brings." A bone marrow or cord blood match also is needed for David Kawika's twin brother, Christopher Ikaika. They are the only patients in Hawaii known to have neutropenia, said Dr. Darryl Glaser, pediatric oncologist at the Kapiolani Medical Center for Women and Children. A third case is unconfirmed, he said. About one in a million people are thought to suffer from neutropenia, a condition in which no white blood cells are produced to protect against infections, Glaser said. Most children with neutropenia didn't live beyond their second or third birthday until a drug injection became available to force the body to make white cells, Glaser said. The Schutte twins were getting daily injections, but then David, also called Kawika, developed leukemia. He couldn't be treated with chemotherapy because it would wipe out his immune system and expose him to potentially fatal infections, said Dr. Randal Wada, Cancer Research Center of Hawaii molecular biologist and bone marrow transplant surgeon. The Schutte family is pictured, from left: Celeste, 11, mother Christine, twins Christopher Ikaika and David Kawika, 6, father David and Chanda, 12. The twins were born with the rare blood disease neutropenia, and survived on medication. David Kawika was diagnosed with leukemia in 2005, went through aggressive therapy that stunted his growth and finally found a matching umbilical cord blood transplant that virtually cured the disease. His twin brother may also need a transplant if his condition doesn't improve. "Generally, the only known chance for a cure right now is through a bone marrow transplant," said Wada. But there were no matches for Kawika out of almost 7 million donors in the bone marrow registry, he said. "One of his tissue-typing genes is so rare it was practically unique. His brother is in exactly the same predicament," Wada said. Umbilical cord blood contains the same stem cells as bone marrow, and can be used to treat patients with cancer and other life-threatening diseases. "Had David not had this one cord who matched him, he would have died from leukemia," Glaser said. "This came through just at the right time." Cord blood doesn't have to be an exact match, but can be used when five of six tissues match, explained Wada, founder and medical director of the Hawaii Cord Blood Bank. "We found that for Kawika." The donation didn't originate in Hawaii. Cord blood donations in the islands have benefited 19 patients, but none locally, Wada said. Kawika's match was found through the National Marrow Donor Program's cord blood database. "We'll never know who donated the cord blood unit he got. For all we know, a mom said, 'Why not?' and that's why a chance (at life) was given to this family," he said. 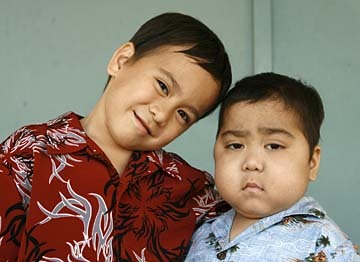 Wada and Glaser, who work together as part of the Children's Blood and Cancer Center at Kapiolani Medical Center for Women and Children, performed Kawika's transplant. 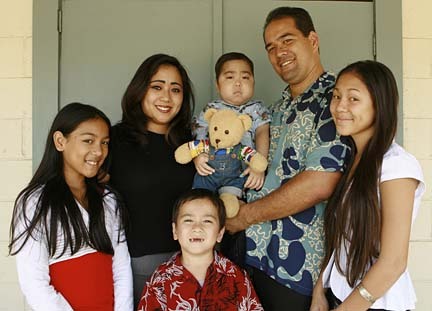 Kawika was admitted to the hospital April 27, 2005, and had Hawaii's first cord blood transplant 10 days later. It took 10 minutes, his father said with amazement. "It was really fast. It (the cord blood) comes in a skinny pack and they just put it in a syringe ... and it's continuously flowing in." Glaser said cord blood is believed to be a little better than regular bone marrow for transplant "because the cells are so fresh and young, you don't have to have as complete a match with the umbilical cord as with a marrow donor." Kawika has had some side effects because the blood wasn't a perfect match, but he is doing well, Glaser said. The oncologist explained that because Kawika has new bone marrow-making blood, "You could say he has entirely new blood as well. The new bone marrow is fighting his body because it doesn't realize the body is its new home. ... It will happen in time." Schutte said Kawika "goes up and down" as his body adjusts to the new blood. "He's running around playing like everybody else when he's feeling good." A teacher goes to the Schutte home in Waianae to teach Kawika. "He likes his homework. I'm kind of surprised," Schutte said. "Every time the teacher comes over, he has his chair and books there at the desk, with everything ready." Some of the medicines Kawika must take stunted his growth, Schutte said, noting he's about the height of a 3-year-old. Glaser said the family is looking into growth hormone shots for the child. He said neutropenia is beginning to be better studied as children live longer. More than 600 patients, including Kawika and Ikaika, are listed in an international registry, he said. The registry is producing more information on the disorder and treatments, he said. "It helped give the diagnosis and supply the shots to the (Schutte) family." Ikaika, a first-grader at Makaha Elementary School, is still getting injections and is being tested every six months to see if leukemia is developing, Glaser said. Said Wada: "I keep thinking with their multiracial background, their best chance is going to be somewhere on this island. I tell their dad, 'Any day some kid is going to be born, maybe out in Waianae within striking distance of a match, that will be compatible.' "
Pregnant isle women can help save someone's life by donating the umbilical cord blood to the Hawaii Cord Blood Bank after the baby is delivered. Castle Medical Center is the newest hospital to participate in the program. The others are Kapiolani Medical Center for Women and Children, the Queen's Medical Center, Kaiser Permanente's Moanalua Medical Center and Tripler Army Medical Center. Umbilical cord blood can be used to treat patients with cancer and other life-threatening diseases. The Hawaii Cord Blood Bank, a nonprofit community service organization, collaborates with the Blood Bank of Hawaii to send the donated cord blood to the Puget Sound Blood Center in Seattle. The center processes and stores the blood and enters it into the National Marrow Donor Program's cord blood database where it is available universally. Donors should be older than 18, in good health, with a normal pregnancy. They should decide by the sixth month of pregnancy. They need only to fill out screening and consent forms. There is no cost, and donations are anonymous. For more information, or to sign up as an umbilical cord donor, call 983-BANK (2265) or visit the Web site: www.HCBB.org.